A chance meeting with a violinist led to a concert and auction being arranged in an attempt to raise much needed funds. 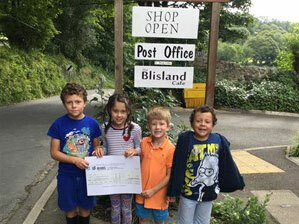 A planning team was quickly formed, and the concert, raffle and auction raised over £7,500. The shop was saved but the fun was only just starting. For the first few weeks we had to pay for the Bookers order on personal credit cards as Booker would not give us credit due to failed direct debits. We then began moving all suppliers from mostly being paid cash from the till to bank payments. The previous Committee was very unhappy at what had happened and initially the new committee faced a certain amount of criticism from locals, despite the shop being saved from closure. Criticism largely stemmed from changes which needed to be made to save the shop such as reducing paid staff hours and increasing the use of volunteers as well as reducing shop hours. A major setback was the discovery that an electric meter reading had not been applied since 2014. After some negotiation with the energy company, it was agreed that they should have been more vigilant in obtaining and applying the meter reading. They gave us a credit for over £3,000 meaning we could continue trading. After applying every month since January 2017 to Persimmon Homes for a Community Champions grant, in July we were awarded £900 from their Community fund with a further award of £1,000 in August. At our AGM in June, we were able to show everyone full details of the previous year’s financials and how the first six months of the current financial year were going. This enabled us to demonstrate the shop’s journey from near insolvency to being a successful operation but still needing to keep raising funds to pay off loans taken out.A major turning point came in January when we were able to afford to appoint a Manager. Sonia has been able to change the look and feel of the shop and café and has brought in many local suppliers. Upon taking on responsibility for the shop, we discovered there were four loans, two to a bank and two to local people who had kindly leant the shop money to allow it to keep trading. Repayments on these were costing a crippling amount for a small village store. After the AGM, one of the villagers suggested asking everyone in the village to donate. It was calculated that if all householders gave just £5 per month we would be able to pay back a substantial amount. The appeal has been successful so far, and we are now able to pay off the local loans and reschedule the bank loans to a manageable figure. It has been a year of constant change. In May, the Postmistress resigned and following paperwork and form filling the Shop took over running the Post Office. Sadly, due to NHS cuts the Monday afternoon Doctors surgery held in the consulting room was forced to close but we are still able to handle prescription orders saving people having to travel into Bodmin, our nearest town. In July, we received a massive boost with a visit to the shop from HRH the Prince of Wales, Duke of Cornwall and HRH the Duchess of Cornwall. 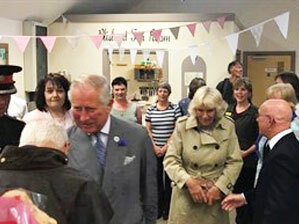 It was a wonderful day and the visit was a huge success and a real accolade for the Shop, PO and Café. Reflecting on the last 10 months, a lot has been achieved but there is still a lot to do. We need to make the café profitable and further increase footfall in the shop. We also need more volunteers to come forward. It has been an amazing journey, and through involvement in the shop I have met some lovely people and made many new friends. Running a Community Shop is not easy. 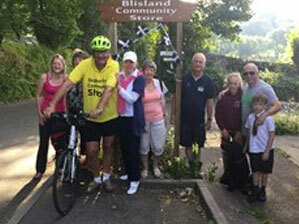 But it is highly rewarding and wonderful to see how the people of the village come together in times of need to provide a much-needed focal Community point and services which are vital for many in this remote part of Cornwall. Royal visitors at the shop!